We apologise for our overdue silence!!! We had a major technical set back. We are almost out of the woods and should soon be posting as usual. Thank you for your patience and sorry for any inconvenience! NZD is the strongest currency, continuing after it pulled back a little. EUR is the 2nd strongest currency, pulling up after a steep fall. CAD is the 3rd strongest currency, losing some ground currently. CHF is the 4th strongest currency, a bit flat after a steady fall. AUD is the 5th strongest currency, continuing its bearish move. 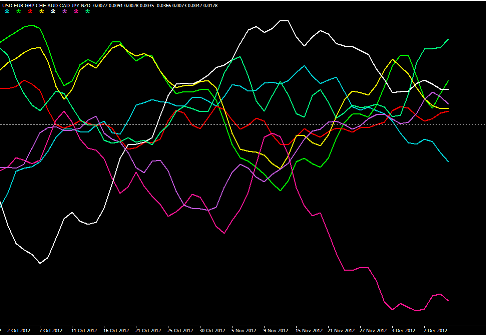 GBP is the 6th strongest currency, hovering around the line between strength and weakness. JPY is the weakest currency, continuing to strengthen after its bearish fall. USD is the 2nd weakest currency, continuing to weaken. Traders note: As volatility is still the word of the day we will be watching our trades carefully and taking profit quickly. No time to sit around and hope for trends.